This program is designed by top makeup artists in the industry to equip you with the knowledge and skills for an exciting career as a professional makeup artist. The Makeup Artistry Diploma consists of three modules. A certificate is awarded for each module; successful completion of all three modules earns a diploma. This 120 hour program focuses on the areas necessary to excel in the industry: fashion, photography, bridal, retail, film, television, stage, decades, editorial, celebrity and working on set. It also includes portfolio building and teaches you to market yourself. The certificate program is divided into 4 semesters. The courses require a professional makeup kit ($700) that is charged at the time of registration. Some semesters require a photoshoot ($50) that is charged at the time of registration. This 40 hour program expands your knowledge and skills as a professional makeup artist. Advance your skills by learning specialized methods of makeup application currently used by skilled makeup artists in the industry. 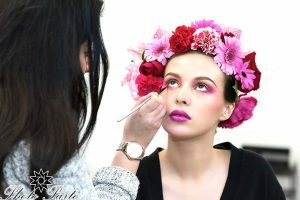 The course covers basic application techniques, facial makeup, bodywork, and stenciling. The course requires a professional makeup kit ($350), an airbrush gun and compressor ($275) and one photoshoot ($50) that are charged at the time of registration. This 30 hour program will equip you with the techniques and skills to create various hair styles. Learn how to create beautiful bombshell hair for photo shoots, finger waves for decades, wedding updos and much more. This program is customized to give you a lead in the industry as a freelance beauty specialist. The course requires a professional hairstyling kit ($85) that is charged at the time of registration; please register early to enable the kits to be prepared before the first class. A supply list of other items to bring (eg. curling iron) will be emailed by the instructor. Semester 1 introduces makeup fundamentals and full application. Topics covered include: brush use, colour theory, bone structure, skincare, working with various face / eye / brow / lip shapes, skin types and skin tones, corrective techniques, day into evening, and professional standards in the industry. The course requires a professional makeup kit ($700) that is charged at the time of registration. Please register early to enable the kits to be prepared before the first class. Semester 2 teaches advanced skills and specialized aplications for themes. Topics covered include: bridal / Indian / Asian / Western, types of products, how to build clientele, and creating makeup theme and colour selection for weddings. The course requires a photoshoot ($50) that is charged at the time of registration. Semester 3 introduces advanced and specialized makeup. Topics covered include: editorial, indoor, outdoor, black & white, men’s makeup, makeup styles from the 1920s–1990s, and how to translate to editorial and fashion. The course requires a photoshoot ($50) that is charged at the time of registration. Semester 4 takes your skills to the next level and includes more creative opportunities for artists interested in theatre, film and creative makup. Topics covered include: advanced makeup, brow blocking, drag makeup, and theatre makeup (opera, showgirl, Cirque de Soleil). The course requires a photoshoot ($50) that is charged at the time of registration. I had a great experience in this course. I am a certified makeup artist working in the industry. Even though the course was short, the coverage was in depth and thorough and the teacher makes sure to give honest, helpful constructive feedback to help to be your best. I want to take the Airburshing module next. Big plus – the people were so nice!